Islamic Human Rights Commission (IHRC) marks World AIDs Awareness day. 50 percent of all your purchases, from 29 November to 6 December 2013 on the IHRC shop online, will be donated to the Mustadafin Foundation; a charity dedicated to supporting and raising awareness through HIV / Aids projects. We are hosting and organising several upcoming events next year such as 2014 Genocide Memorial Day, Islamophobia Awards, Summer School on Black Europe Program 2014 as well as Assata-Tupac Liberation School and SOAS2. Keep checking back on our website for further updates and news on these events. Very interesting blog ‘No-one expects the Spanish Inquisition: Except Muslims and Jews’. Maybe it is time we started getting scared, says Arzu Merali. Comment made by London Councillor about merging boroughs doomed to failure. The Islamic Human Rights Commission finds repulsive and disturbing comments made by a London councillor that a merger with a neighbouring borough is doomed to failure because the ethnic make-up of the two workforces is too different. Islamic Human Rights Commission (IHRC) marks World AIDs Awareness day. 50 percent of all your purchases, from 29 November to 6 December 2013 on the IHRC shop online, will be donated to the Mustadafin Foundation; a charity dedicated to supporting and raising awareness through HIV / Aids projects. 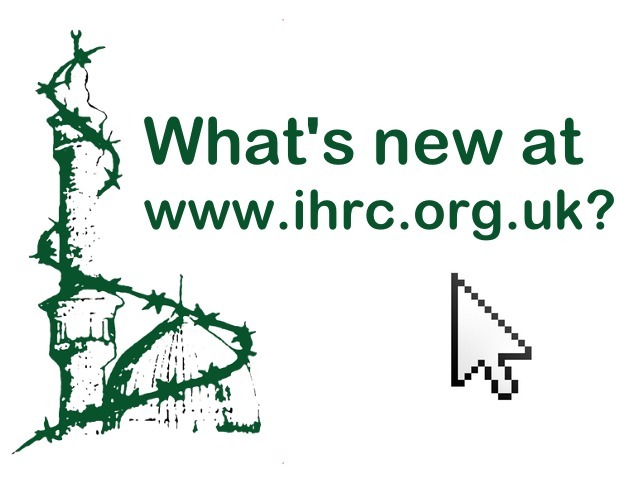 Coming to IHRC in 2014. Artist Mohammad Hamza joins us at the IHRC Gallery in Wembley, North West London in March 2014 to showcase his revolutionary arts. Watch this space for more information in the coming weeks. June 23 – July 4, 2014 in Amsterdam, The Netherlands. Now in its 7th year, the overall goal of this intensive two week course is to examine the contemporary circumstances of the African Diaspora in Europe. We will focus on the historical and colonial legacies of European countries to discuss the origins of Black Europe and investigate the impact of these legacies on policies and legislation today. Mark Gonzales shares his philosophical reflections based around his concept of ‘waging beauty’. On Monday November 4th Nazim Ali of the Islamic Human Rights Commission hosted a standing room only event with spoken work poet Mark Gonzales entitled ‘poetic secrets to surviving the idiots’ in addressing the question “how does one stay alive in a time when it is almost painful to be intelligent?” in the pleasant surroundings of Housmans Bookshop in Kings Cross central London. This follows on from the previous events IHRC have had with Mark Gonzales including the conversation with Mark Gonzales and his participation at Genocide Memorial Day 2013. A successful storytelling session at the IHRC Bookshop, on Saturday 19 October, the IHRC Bookshop hosted “Che Guevara, The Kind Traveller”, told by the author Zainab Zahra with brilliant illustrations by Iffath Zahra. Resources and information on Mustadafin Foundation. The Mustadafin Foundation was established in 1986. It emerged during the Apartheid era in response to political unrest and violence that erupted due to faction fighting in Langa, which had devastating effects on the local communities, particularly women and children. Maybe it is time we started getting scared, says Arzu Meral. Great news for all, that Monty Python are reforming and will be playing the O2 next year. I happily watched a clip on BBC Breakfast a couple of days back of the Spanish Inquisition using the soft cushions and comfy chair of torture on a little old lady in order to get her to confess to heresy. As it ended, I reached for my phone to post the infamous line “No-one expects the Spanish Inquisition” on my various social media profiles, when the phone rang: a request from BBC 3 Counties Radio to take part in a phone- in on Judge Khurshid Drabu’s comments about women wearing nikab. Comment piece on Myanmar by Yaseen Omar, UK based commentator. The continued denial of citizenship to Myanmar’s Rohingya lies at the heart of their status as one of the world’s most persecuted minorities. However despite international pressure on the former communist country to introduce democratic reforms, the future for the Rohingya continues to look bleak and bloody, according to Yaseen Omar. Listen to interview with Arzu Merali, Robert Rustem and Sandew Hira on Decolonalism. Campaign Resources: the daughters of the HLF5 send out a video to raise awareness of the case, please take a few minutes to campaign for their freedom. 1001 Inventions and Awesome Facts From Muslim Civilization (National Geographic Kids) [Hardcover] We often think that people from a thousand years ago were living in the Dark Ages. But from the 7th century onward in Muslim civilization there were amazing advances and inventions that still influence our everyday lives. People living in the Muslim world saw what the Egyptians, Chinese, Indians, Greek, and Romans had discovered and spent the next one thousand years adding new developments and ideas. Inventors created marvels like the elephant water clock, explorers drew detailed maps of the world, women made scientific breakthroughs and founded universities, architects built huge domes larger than anywhere else on earth, astronomers mapped the stars and so much more! This book takes the wining formula of facts, photos, and fun, and applies it to this companion book to the 1001 Inventions exhibit from the Foundation for Science, Technology, and Civilization. Each page is packed with information on this little-known history, but also shows how it still applies to our world today. Written by the great fourteenth-century Arab scholar Ibn Khaldun (d.1406), this monumental work laid down the foundations of several fields of knowledge, including philosophy of history, sociology, ethnography, and economics. This book presents the visual history of blacks in the British Isles. Spanning over two hundred years, this is an unprecedented collection featuring 321 black and white photographs, with an introduction and commentary by Paul Gilroy and a preface from Professor Stuart Hall.